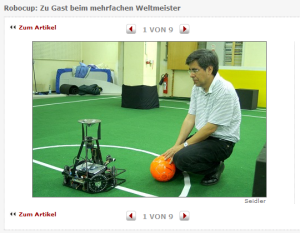 We have been building autonomous soccer robots at the FU Berlin since 1998 and took part in our first RoboCup tournament in 1999. We were active in two leagues until 2006. Starting with 2007 we moved to the humanoid league. Our team, the FU-Fighters, was composed of two types of robots: small-size (18 cm in diameter) and medium-size (50 cm in diameter). The small robots are controlled by an off-the-field computer, which receives video images from two cameras positioned above each half of the 4 by 5.5 meters field. The computer sends the robots commands using a wireless link. Our medium-size robots are fully autonomous: they carry their own camera and a laptop, which processes the video images at 30 frames per second. Our medium-size robots use a special mirror that provides a 360 degree view of the field (omnidirectional vision). Both types of robots, small and medium-size, have omnidirectional wheels. 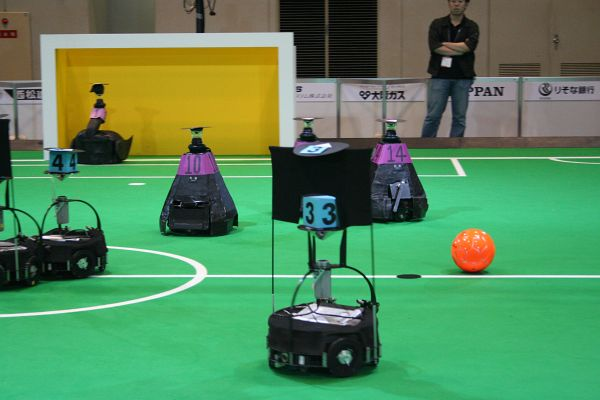 Our soccer robots are an ideal platform for investigating Artificial Intelligence issues such as behavior control and learning. We have experimented with adaptive algorithms for computer vision and with reinforcement learning for strategy. Our robots can learn from their experience during actual games. The small-size FU-Fighters robots are the World Champions 2004 and 2005. They won second place at the RoboCup tournament three times, third place once, and fourth place once. They are four-time winners of the international German Open tournament, and European Champions 2000. The medium-sized robots won fourth place at the German Open 2004, and second place at RoboCup 2005. 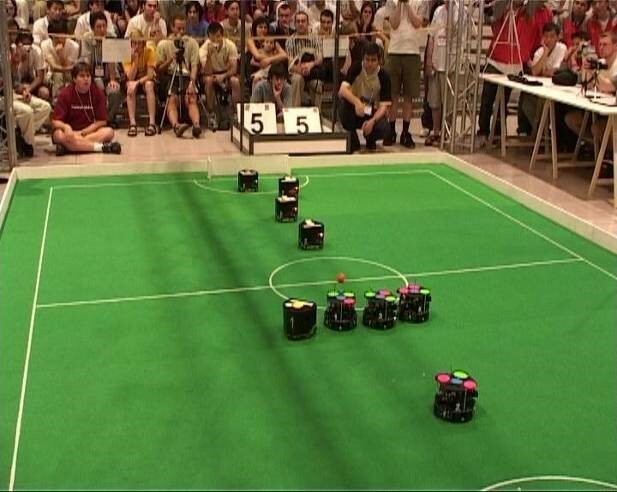 A game scene during RoboCup 2005 in Osaka, Japan. The FU-Fighters robots have the blue markers. Around 12 students worked under my supervision each year on this project, which was funded by the Deutsche Forschungsgemeinschaft (DFG) from 2002 to 2008. Dozens of FU students took part in the eight world championships in which the FU Fighters participated. Los FU-Fighters (robots con ruedas) fueron substituidos a partir de 2007 por los FUmanoids (robots humanoides).